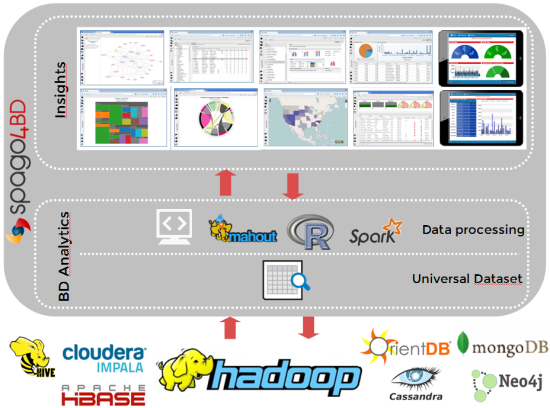 Spago4BD is an enterprise-level open source solution for Big Data analytics. CEP (Complex Event Processing), based on the open source eBAM (Eclipse extended Business Activity Monitoring) and Flume. NoSQL databases (e.g. Cassandra, Neo4J, MongoDB, OrientDB). Spago4BD offers a wide range of tools to gain visual insights into your data, such as self-service BI, custom analysis (e.g. reports, charts, dashboards, maps) also accessible from mobile devices, as well as federation of Big Data with traditional data sources and/or data hosted in external repositories thanks to advanced mash-up techniques. As a result of the adoption of open standards, Spago4BD can easily be integrated with existing environments, according to users' specific needs. Moreover, its fully open source license enables software re-use in favour of the entire community. For further information, please contact: spago4bd@eng.it.